But if you run a command-line script like Drush or Artisan from the command line, even if you run them through the MAMP php binaries (see below), Xdebug will not be loaded automatically. This is actually a good thing, because Xdebug slows down PHP a lot, but you still need it when you want to debug. So we need to load it on demand. I imagine there's a way to do this with environment variables or command line switches, but I wasn't able to find one that worked for me. Thankfully, I can do it from PhpStorm. Go to Preferences > Languages & Frameworks > PHP. There is a project setting for CLI Interpreter with a little ellipsis button. Click that to open a CLI Interpreter settings, where you can tell PhpStorm where to find any versions of PHP you can access to, both locally and remotely. To get to this quickly, use Help > Find Action (on macOS use Cmd-Shift-A) and type "CLI Interpreter" (you won't have to type all of it). You can paste that setting in (I use Path Finder, which has a "Copy UNIX Path" command that makes this easy), or use the ellipsis button to open a standard file dialog from which you navigate to it. This is probably everything you need in terms of general setup. I also set an environment variable in my shell (I use fish), but I don't know if it's absolutely necessary. In other shells, you'd use setenv or export to do the same thing. I first set all this up to debug a Laravel database seeder, which is used to populate a database with automatically-created fake data. But this works for any PHP script that's connected to a project you're working on. 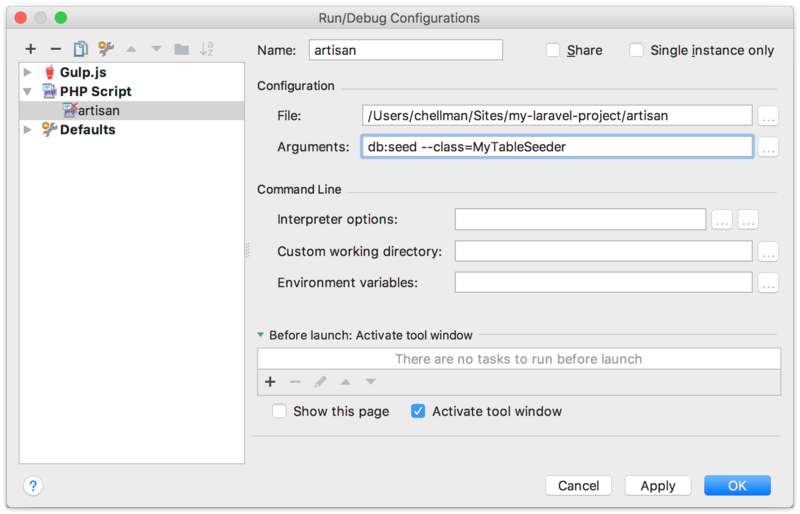 Because Laravel projects include their own version of artisan, it's pretty easy to debug it using a new debugging configuration. Choose the menu item Run > Edit Configurations, or use Help > Find Action to get there faster. Create a new configuration with Cmd-N or the plus button, and choose "PHP script". With this done, you'll have a "Debug 'artisan'" command in the Run menu that will run the script with Xdebug attached, and stop at any breakpoints you've set. For browser-based debugging, PhpStorm's "zero configuration debugging" works very well for me, but for the command line, this is working well. It's a little more configuration, but most of this is only set up once, and certainly saves me a lot of time once it's done.